Wonderful. We are no longer "newly weds." At least that's what I think. We are now officially pros at being married. Daniel and I have had a wonderful first year together with lots of great times and crazy adventures. I never thought my life could turn out to be a million times better than I ever expected. I guess that's what happens when you marry your perfect soul mate. Just to let you all know, I finally got a job. I guess after four interviews they finally decided that they liked me enough. I am now working full time at our local hardware store as a cashier. Today was my first day on the job. My head was about to explode. I have had ZERO experience with hardware and everything is still completely new to me. Other than that I think I'm going to like my new job. Wish me luck with the rest of training! 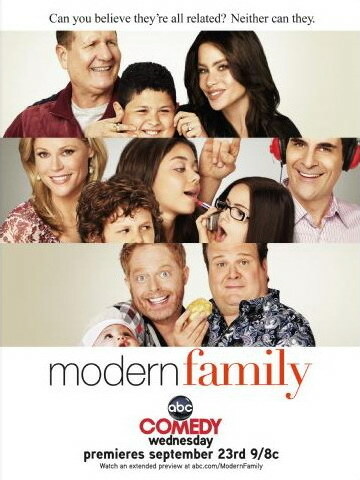 The second season of Modern Family starts tomorrow night. We are just pleased as punch. Party at our place for anyone who wants to come watch. Yes, that is my husband. He is famous. If you look to the far left you will see that I also made the front page. I'm famous too. To watch a video about the Men's cross country race last week click HERE. This is a small little restaurant close-ish to where we live. All I have to say is YUM YUM YUM. 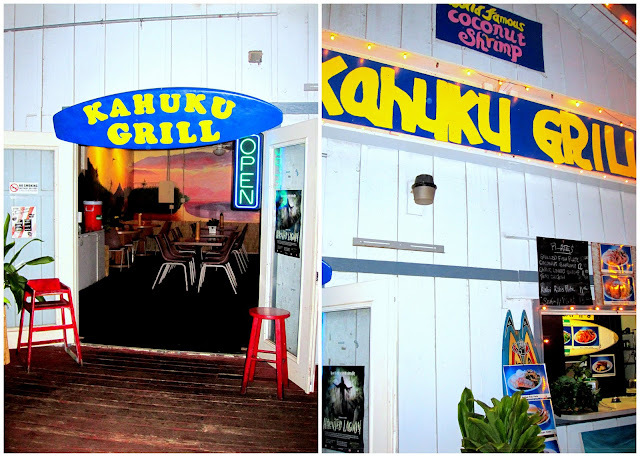 Daniel and I got coconut shrimp, the best we've ever had. We also love Taco Tuesdays, but unfortunately it was a Saturday. We went with our friends in celebration of Beau's Birthday. We had a blast this weekend at ward camp. Daniel and I really have the BEST ward ever. We have met so many great people and have made a lot of awesome friends. We camped out at Hukilau Beach. Let me just tell you...camping on the beach in Hawaii is quite the experience. It is so warm at night, we didn't even need any blankets. It was great. Also, falling asleep to the sound of the ocean in the background is so relaxing. I woke up extra early Friday morning, hoping to catch the sunrise, but I barely missed it. Darn. But I still got some good pics. We had a great time playing games, watching movies on the projector, going to the beach, hanging out with our friends, and eating LOTS of food. Soccer on the beach was a big hit. We watched the boys play. Daniel was a cheerleader too. Poor Daniel forgot his swim suit. Daniel shaved his coconut in 2 minutes and 38 seconds. He got one of the best times for a non-Polynesian. 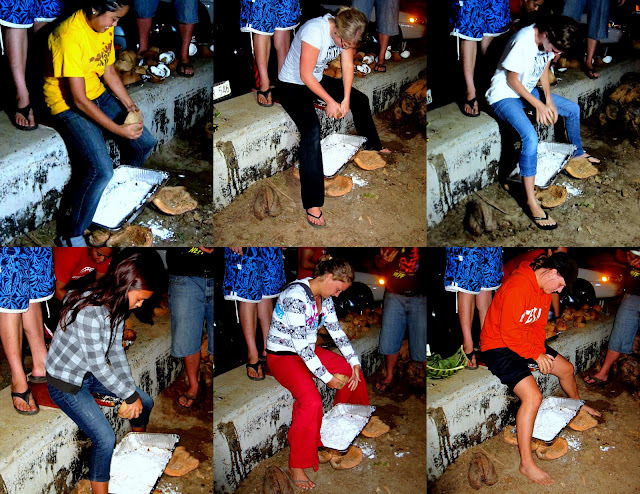 Six of us girls took turns shaving one coconut. It took us 9 minutes and 40 seconds all together. Dolly dominated all of us. Fortunately, Poly's don't count in the competition, or we would all lose terribly. She shaved that coconut in 18 seconds! Isn't my husband the cutest? Garrett Sandberg is our next door neighbor. They love playing Fifa...a little too much. Daniel lost his wedding ring in the ocean. Daniel proposed to me on a row boat too. Ha. I just finished this book last night at 2AM. 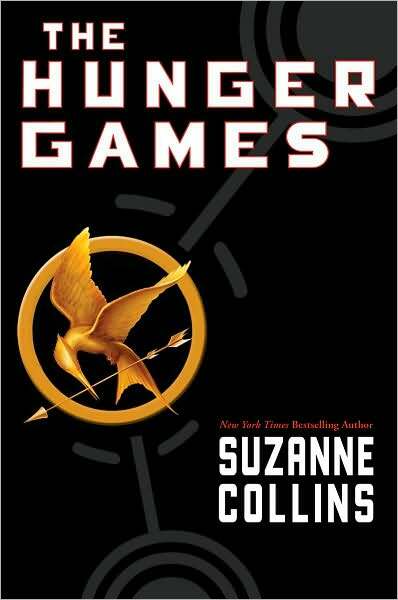 Now onto Catching Fire...then Mockingjay.